As most readers of our blog already know, 19 days after Dianna’s Dad passed away, her mother joined him. She fell and injured her back while getting ready for bed. Nothing was broken but she was in severe pain from a nasty bruise. The pain prevented her from breathing deeply or from coughing productively. Apparently this allowed an infection to slowly develop in her lungs and full blown pneumonia followed. She was just too frail to fight it off and passed away on October 24th. She was buried beside Dad on the 29th. Of course, all the family gathered once again. It was much more difficult emotionally this time, but also a lot easier from a practical standpoint. We already knew who to contact and what to expect. Her service was almost a carbon copy of Dad’s, and most of the same people attended. It was held in the church she attended for 83 years. The biggest impact this time is that now we have a house to empty out and sell. Dianna and I had planned to stay in the area until Mother was settled in an assisted living center, so our focus just changed to going through the house, inventorying everything so we can decide who wants what, and moving forward with plans to distribute or sell everything. We spend 5 days a week in the house but return to our home, which is parked in Bakersfield, a couple days a week. The house went on the market today. Obviously it is a tough time on everyone but time has a way of taking the edge off. We are focused on what we have to get done, but keep finding things that remind us of how much we will miss Dianna’s parents. It gets easier as we go along, but easier is relative. We plan to stay here until the middle of December when we will go to Texas to be with Dayna’s family for Christmas. We have decided to buy Widener’s car and we will drive it so we can license it there. We do not plan to take the trailer since we will only be there a short time, celebrating Christmas and keeping annual Dr. visits. The car is a 1999 Lexus GS300. It only has 52,000 miles on it, and Dianna and I have probably put the last 5,000 on it during the past few summers. Greg’s family will be here in early December and we hope to finalize what goes where by then. When we return after Christmas we will stay here until all the contents are distributed. Then we will move on to who knows where, and hopefully our life will again return to something approaching normal. We both appreciate all the emails, phone calls, cards, flowers, food and prayers that have come our way from family and friends. They have helped us cope and provided much needed support. After getting our power and phone situation taken care of we have settled into a routine. Dianna has spent some time with her folks, taking them to Dr. appointments, etc, but they are now past the latest issues and seem to be settling back down to normal. We plan to go down there again this weekend to spend Mother’s Day. When the weather has cooperated we have done some hiking and scooting. Just a couple days ago we hiked up the McGill trail on Mt. Pinos. We started at 6,200 feet and finally turned back at about the 7,100 foot level when the snow banks became too deep to cross. It was good exercise and we found a couple geocaches along the way. We have had three separate overnight snowfalls since arriving here, but they have all melted off the following day, even though the temperatures sometimes did not get out of the 30′s. Other than costing a lot for propane and electric, this has not been a bad place to stay. We usually travel to Bakersfield to do our shopping. There is a Wal-Mart Supercenter and a Costco on the south end of town, so it is only about 40 miles. The road is much better than the road south. We have taken the scooter on those days when the weather is nice. One day while Dianna was staying overnight at her parents, I rode the scooter down the back way to Ojai. The roads were all twisty and over a few mountains. They were perfect scooter roads, and I saw far more motorcycles than cars. The other thing I wanted to get done before traveling this summer was some repair work on the truck. It’s hard to believe we have already put almost 70,000 miles on it. It now has 650,000 miles on the odometer. When we originally purchased it, the ABS system was disabled during the removal of the third axle. I have also been experiencing some issues with the Jake brake system, so I took it to a Cummins dealer in Bakersfield for the Jake repair, and then up to Fresno to a Volvo dealer for the ABS repair. I left the truck in Fresno and rode the scooter back, a trip of about 180 miles down highway 99. We were notified yesterday that it was ready so we drove up to get it. Dianna called her cousin Carrie and we arranged to meet her in Fresno for dinner. The girls were very glad to have an opportunity to see each other. We got home about 9:30 last night. That’s about it. It’s hard to blog when there really isn’t much going on. On cold days we often don’t leave the trailer, but we have plenty to keep us busy with internet access, TV and Dianna’s crafts. Our tentative plans are still to leave here about the first of June and head north and east. Dominic will probably fly to Minneapolis around the first of July to meet us. We will explore the area around Lake Superior and the UP of Michigan as we make our way toward Boston for Patricia’s wedding on August 8. After that we may head up into Maine, but who knows for sure. There is not a lot going on, but it seems people still want to hear about it. Surprisingly, time passes quickly here in the desert, and we manage to keep busy. We have been doing a fair amount of Geocaching, which is fun and good exercise. We logged 12 caches one day and 11 another. I think we have over 70 caches now. We went to Lake Havasu City for my birthday and Valentines Day. We spent the night in a hotel there and had a nice dinner in a restaurant overlooking London Bridge. While there we stocked up on groceries at the Super Wal-Mart, and we checked out a boondocking area in a narrow valley just north of town. It might be a good place to spend a little time, except that the valley is so narrow that our solar panels would not get as much sun as in more open places. Still, it might work. Daryl, Gisele and Angela stopped by for a quick visit the afternoon we returned from Lake Havasu City. We are always happy to have guests, especially when they come bearing gifts of kettle corn! This past Monday we moved from the desert near Quartzsite to the desert near Imperial Dam. We are located along the Colorado River about 29 miles north of Yuma and next to the Yuma Proving Ground Army base. It is nice being closer to a larger city because shopping is definitely more convenient. We also enjoy the ride into town on the scooter since it travels through agricultural fields and date orchards. Unfortunately, the roads here in this remote section of California have been allowed to decay terribly, and they are all potholed and quite rough. It does make riding the scooter a lot less enjoyable. I think we are going to start taking the long way around through Arizona (8 miles further) just to avoid the bad roads. Yesterday we made our semi-annual trek to Algadones, Mexico to have our dental checkups and cleanings. We have been to the same dentist three times now, and are pleased with her work. Cleanings are $25, and that is all each of us required this visit. If everyone had access to Mexican dentists, dental insurance in the US would cease to exist. That’s about it. A weekly routine of exploring on the scooter, geocaching, hauling water and waste on laundry day, TV, Internet surfing, hiking and enjoying the temperatures in the low 70′s. We still plan to be here until about the first of April when we will move to the mountains between Los Angeles and Bakersfield. Probably. As we have often said, our plans are set in Jello. This continues to be the case. After spending the holidays with the Jennings in Texas, we traveled west to Mesa, AZ to find warmer weather and visit family. We found warmer weather but we also managed to arrive in time for one of the worst winter storms in history in the southwest. The storm resulted in the lowest barometric pressure ever recorded in Phoenix. When the big storm went through Arizona we were camped along the Salt River north of Mesa and Apache Junction. The wind blew over three trees in the area where we were camped, and the rangers put us on notice that we might have to evacuate because the river was rising so fast due to rain and water released from the dams. We didn’t have to leave, but it was a pretty wild night anyway. We then moved to our current location in Quartzsite where we plan to stay until the first of April. We arrived to much warmer weather and lots of people. The large RV show is held the third week of January, and there is a real crowd of people here. It will clear out soon and by the first of March it will be just us few diehards. Our plan was to stay here until the first of April and then begin our camp hosting position at San Onofre State Beach where we have been for the past four summers. After last year we decided that six months is just too long to host in one spot. It had begun to feel much more like a job than a volunteer position, and we made tentative plans to stay only three months, then travel east so we could attend our niece Patricia’s wedding in Boston in August, then visit other relatives in the northeast, and finally swing south during the fall and spend some time near Darin in Tennessee. I sent an e-mail to the Park Ranger who coordinates volunteers, letting him know of our desire to spend only three months at San Onofre this year, as we did in 2007 when we went to Alaska. He responded that he wanted only people who would stay for the full six months, so unless we change our minds he would recruit new hosts. We’re not changing our minds so the Jello has slipped again. It will be interesting to see how things work out for San Onofre. They have historically been unable to find and retain camp hosts for the position we held. Given the less than ideal conditions there, I think they would have better luck finding two hosts to serve three months apiece during the summer months, but that is not my decision to make. Anyway, our plans are not set yet, but we will stay here or in Yuma until about the end of March when it gets too warm, then probably somewhere in Southern California for the months of April and May, and then head north in June, work our way across the northern part of the US more slowly than previously planned, and still arrive in New England around the first of August. We were not looking forward to making the trip from California to Massachusetts in only four weeks, so this will give us more time to see things and will make the trip much more relaxed. Stay tuned. We’ll let everyone know what develops as we go along. We’re going to be great-grandparents sometime this fall!!! Christine just found out she’s pregnant! I’m so thrilled as we will be in the east this fall for a possible wedding (Patricia, Greg’s oldest, is getting married this fall or next fall after she graduates, in Boston) and now to welcome a new life into this world. Congratulations Christine and Nathan! Sunday did turn out to be a football day, but we really needed it because Monday we took our most ambitious hike of all. The Lost Mine Trail starts from the highest elevation the Chisos Basin road gets to, around 5,700 feet, and climbs 1,100 feet in two and a half miles to the top of a ridge where there are magnificent views of the basin and the surrounding desert. The trail has nature markers and a booklet describing things to provide reasons to stop every few minutes, but it is still up every step of the way. Thank goodness we had worked our way up to this one, and thank goodness we had rested the previous day. It was a good hike and we spotted a white tailed deer in the trail on the way down. Tuesday we recovered from the previous day’s hike with just a short hike on the nature trail that starts in the campground. Unfortunately the start of the trail was washed out in the floods last year so we had to hike a circuitous route around the beaver pond instead of taking the boardwalk over it. The trail climbed a small hill near the river that had nice views. That evening we gave ourselves a treat. We rode up to the Basin Lodge and had dinner at their restaurant. The food was OK, not great, but the views were worth it. Wednesday we took our leave of Big Bend, having given it a pretty good look over for almost two weeks. We feel like we know it pretty well. We drove to Pecos, TX were we stayed in an RV park so we could do laundry. Thursday we traveled east on I-20 to Midland, TX where I spent a couple hours touring the Permian Basin Petroleum Museum. I found it interesting but Dianna stayed in the truck and read. Afterwards we motored north to a small county park north of Andrews, TX for the night. Today we will move further east somewhere, and probably spend a couple days getting to Denton where we plan to spend the holidays with Dayna and her family. Thursday we did some exploring on this side of Big Bend. First we went to the visitor center here at Rio Grande Village, then rode out to Boquillas Canyon where the river again cuts through a mountain in a spectacular gorge, then on towards the center of the park at Chisos Basin. On the way we stopped at Dugout Wells where a small community sprang up around a well in the early part of last century. The only school in the area was located there. It is now a pleasant oasis in the middle of miles and miles of desert. We continued on to Panther Junction where the park headquarters is located, along with the largest visitor center. We then headed up the steep and winding road into the Chisos Mountains to Chisos Basin. The Chisos Basin in considered the heart of Big Bend NP. The Chisos Mountains rise from the desert floor in the center of the park to a height of 7,832 feet. The developed area is in a bowl located within the center of the mountain. It feels similar to being inside a volcano. There is only one opening, called the window, with a view of the desert below. There are very tame deer wandering around and one of them approached to within 10 feet of us as we ate a picnic lunch. After lunch we took the Basin Loop Trail through the pines. It was only about 2 miles but it gave us a good feel for the area. It is just barely in the pines at about 5,400 feet, so there is a combination of trees and cactus but it was much cooler than down by the river. We had a pleasant afternoon and plan to return to do another hike in the area, as well as have dinner at the lodge some evening. 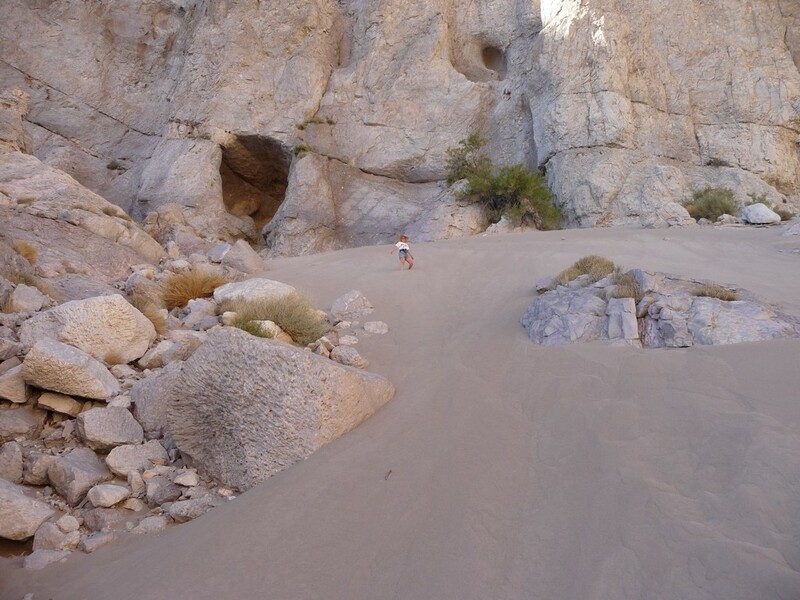 Friday we returned to Boquillas Canyon and took the short trail into the canyon. It ends where the rock walls come down to the river. Just before arriving at the end there is a cave high on the wall with a steep sand dune leading up to it. The angle of the sand is extremely steep. It took us 10 minutes or so to climb up it, but only 20 seconds to come down. Along the trail we discovered Mexican trinkets lying on the rocks, with prices marked and jars for money. Mexicans living across the river come over in canoes when no one is watching, and leave the items, hoping to make a little money. As we were hiking in we were suddenly serenaded by a Mexican on the other side of the river. We then came across jars with signs the read “Donation for Mexican Singing.” Dianna did buy a nice walking stick from one of the displays since the prices were about 1/4 of the cost for the same ones in the gift shop. Whatever it takes. Yesterday we decided to attend the Terlingua Chili Festival. We had seen reference to the festival posted on the walls of some BBQ restaurants we have been in, and some of the people here in campground mentioned they were here to attend. 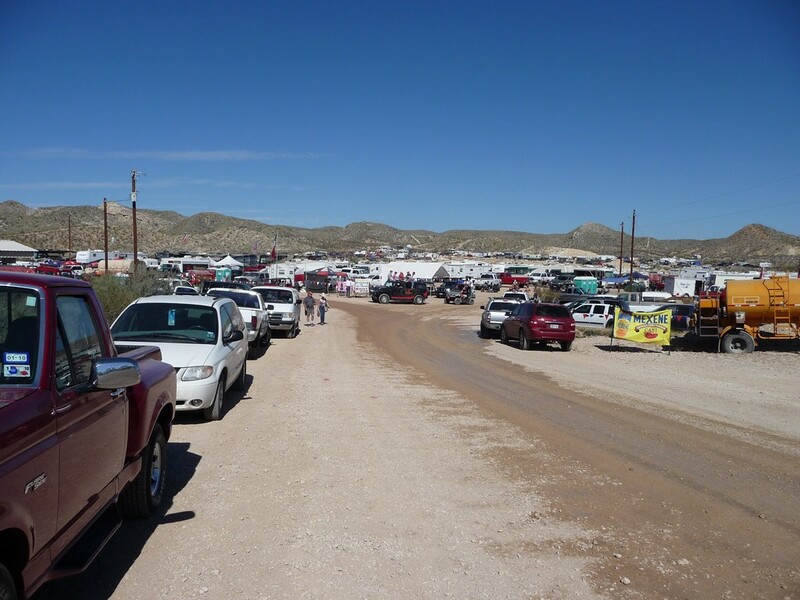 Terlingua is a tiny desert town just outside the park boundaries about 50 miles from the campground. At one time it was a mining town that produced most of the mercury mined in the US. It is now pretty much a ghost town that has become a haven for some artists and others who like to live away from it all. It reminded us of Jerome, AZ without the mountains. We didn’t know exactly what to expect but even so, it was not at all like we thought it might be. While there was some judging and cooking going on, only the participants and judges were paying any attention. In fact, unless you were a participant or judge you could not even get into that area. 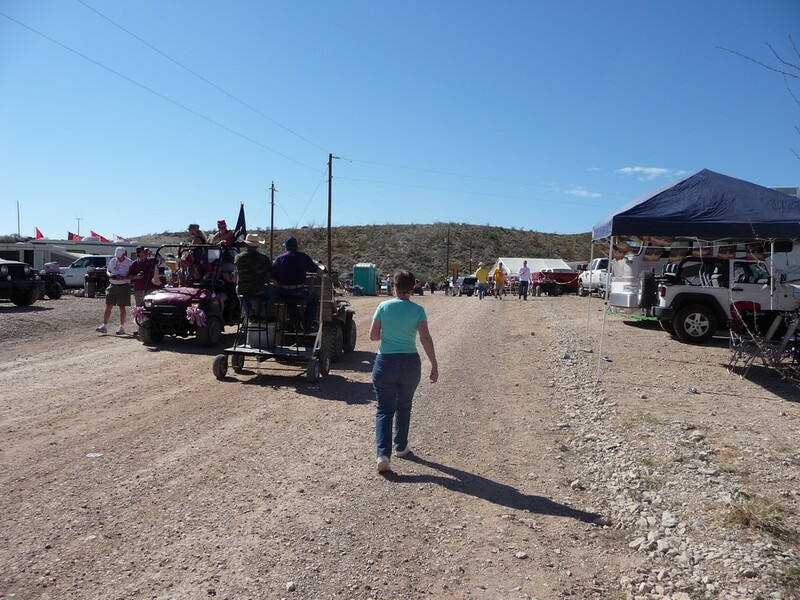 Mostly what it was was a couple thousand people getting together in the desert for four days to drink beer and party. It reminded us of a biker gathering. It was certainly not our cup of tea and we only stayed an hour or so. We did get some free chili and some Buffalo Wings, but they were not worth the $20 admission fee. On the way back we filled up the scooter with gas. Since the speed limit in the park is only 45 MPH we got the best mileage ever — 70.5 MPG. Wahoo! We still have a few things we want to see and do here. Today may be just a football day, but who knows. Soon we will start heading for Denton.